Exact computation of sums and means	Has there been a ‘pause’ in global warming? As far as 1955 and the southern hemisphere, you might want to consider when the first permanent Antarctic stations was established (1957) and how GISS interpolates temperatures across vast distances. There are some parallels here with economics. In both areas there is very little knowledge about the underlying cycles that may take decades to conclude. So in economics we had the Great Moderation followed by a crash, resulting from increased risk in the financial system. I think we are still part of an even larger cycle as debt and therefore risk is still increasing. For the climate we have shifts in large volumes of sea water and the generation of unstable patterns which will cause cycles of varying length. Obviously there are other factors that affect climate, in particular and probably most significantly would be the Milenkovitch cycles, and perhaps to a lesser degree the sunspot cycles. — There are some parallels here with economics. Well, if so, it’s all coincidence. Physical phenomena are ruled by God’s Rules (or Mother Nature’s, as you prefer). Economics is ruled by humans’ fungible rules. Physical phenomena have no control over the environment and processes which determine their value. Economic phenomena are directly determined by prior decisions of humans, mostly by small cabals which profit from changing/bending/breaking some existing set of rules. Which is how we got the Great Recession; it wasn’t the result of any analog to thermodynamics or Brownian Motion. There are two external forces over which such cabals have limited control: burgeoning population and diminishing natural resources. Or as one wag, whose name I don’t remember, put it: “we don’t need 7 billion people to make stuff”. IOW, economic growth doesn’t require or need more people, just more leveler distribution of wealth. Not that the Social Darwinists are interested in that vector. The last paragraph above is off topic. So no more comments along those lines, please, regardless of how tempting a rebutal might be. Scientific argument in favor of anthropogenic climate disruption does not come from observing global temperatures and finding an explanation. Rather, it comes from really fundamental physics (atmospheric radiation + blackbody radiation thermodynamics + law of conservation of energy). The outcome of substantially increasing CO2 emissions were appreciated in the 19th century. The atmospheric lifetime of CO2 is a late 20th century contribution. Accordingly, while, as mentioned, there are many things which can alter global temperatures, including bursts of volcanic particulates, and atmospheric aerosols (and less so, solar variations, even historically: query Faint Young Sun paradox), the long term homeostatic control involves CO2 fluctuations. Plucking a trend out of a temperature series, then, seems to require a pretty strong prior that there is a trend, lest much of independently verified physics lie in a rubbish heap. There have been several attempts to independently verify the major trend finding sources, each vying with one another, with the BEST project being the most pronounced. Experimental science like this is tricky, whether speaking of satellite sensors or (innocently) misprogrammed ARGO floats, and the struggled to reconcile observations with ab initio modeling is always a challenge. Still, I think the geophysicists have come a long way, even if they are better then they use some of the better statistical methods. Two guys who have contributed a lot, in my uneducated book, are Mark Berliner of OSU and Nathan Urban of LANL. 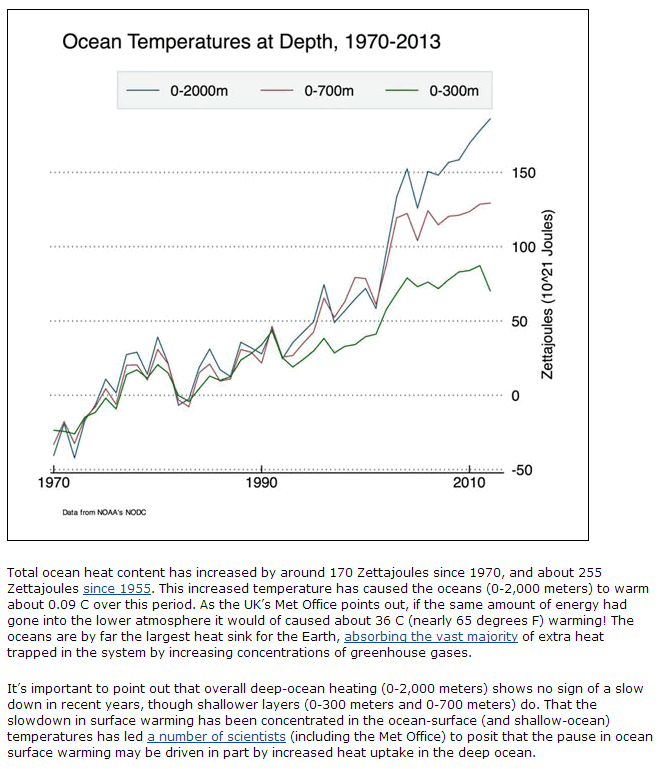 Can I ask if you are aware of the ocean heat content data and the significance of that data? Anthropogenic Global Warming (AGW) is really a consequence of adding radiatively active gases to the atmosphere. These gases change the planetary energy balance. A vast majority (>90%) of the energy associated with AGW goes into the oceans. Only a small amount (a few percent) is associated with warming of the surface. So, assessing AGW, and the role of CO2, using surface temperature datasets only, means that you’re assessing this using data that represents only a small part of the overall system. However, returning to energy balance requires warming of the surface, so understanding the evolution of the surface temperatures is clearly important and understanding how much the surface will warm for a given change in atmospheric CO2 is also important, but focussing only on surface temperatues does ignore a good deal of relevant information. I’m aware that such data exists, but I haven’t examined it in any detail. Off-hand, I’m skeptical that one can actually measure ocean temperature to the very high accuracy, with comprehensive coverage, needed to track heat content, though as I say, I haven’t looked at how they claim to be able to do this. Technically, there are two ways to measure ocean heat content. One is using in-situ measurements (ARGO floats are the ones being used at the moment). The other is sea level rise, which is partly a consequence of thermal expansion. As I understand it, these are largely consistent. My broader point, though, was that focusing on only surface temperatures ignores a great deal of other relevant information and can lead one to infer things that may not be consistent with the overall evidence. It is something that needs to be taken into account if inferences are drawn from GMST/MSU observations regarding climate sensitivity, particularly because changes in ocean circulation have a significant effect by redistributing heat between the oceans and atmosphere. Links. Argo is a remarkable system. Some of these floats are very creatively placed. One, for instance, in the eastern, northern Atlantic, hitches a ride on a surface current in one direct, which it rides for 100 km (approx), then descends to where there is a current flowing in the reverse direction, where it rides back to the vicinity of the area it left. It then ascends and repeats. I have looked at the profiles and series of some of these floats individually. Yes, perhaps one can explain 1930s temperatures by looking at various forcings. That’s more-or-less my point, though – that just looking at CO2 and temperature isn’t going to be adequate. This may seem obvious, but I think it isn’t obvious to the public, and is ignored in some of the “evidence” for CO2 causing warming that is offered to the public. I would add also, going back to the period 1910 to 1930, that a similar process was occurring in the Arctic. Many more stations were added, particularly by the Soviet Union. So similar issues of changes in coverage apply then. And there is also a well documented bias in the Sea Surface Temperature records during the late 30’s/40’s due to a significant change in the mix of ships sampling water temperatures using buckets vs sampling the engine cooling water inlet. This change in the mix occurred due to WWII and the change in the mix of nationalities operating ships. Different datasets have included a correction for this bias to differing degrees. Regarding the increase in variance in 1955, new stations in Antarctica do seem to be the most likely explanation. In an email, Reto Ruedy pointed me to this paper, in which Fig. 2 shows that 3/4 of Antarctica started to be covered only in 1955-1957. Zeke is quite right about there being no data for Antarctica prior to 1955. However, Gistemp still has data for this region right back until 1880. There must be some proxy data used. For the period up until 1955 the data for 90S to 64S very closely resembles that of Base Orcadas located at 60.8 S 44.7 W.
However, Base Orcadas has some highly erratic temperature anomalies, and shows cooling between 1880 and 1930. Can you give some information on what long-period cycles you had in mind? As far as I can see the confounding tends to operate more in the other direction, with likely effect of the combined actions of the forcings being misdiagnosed as a long-period cycle (with perhaps only one or two cycles present in the temperature record). There are good physical reasons to support the forcings having an effect on climate, the evidence for some of the purported long-term cycles have very little physical basis. This was a general point. I don’t have any particular cycles in mind, though others may have such ideas. As I say in the next sentence, “any really persuasive argument regarding the effect of CO2 must be based on physical theory”, which seems to be what you’re saying too. On the classification of “warmer” types, I would strongly suggest that this is largely irrelevant to any sort of statistical questions you’re likely to ask, and presents a potentially biasing effect on how things may proceed. The classifications you’ve presented have little to do with anything based on science and function basically as in-group and out-group identifiers for the purposes of partisan squabbles. If you look at the physical science literature itself, these labels are essentially non-existent. And indeed this should not be surprising. One could easily believe both that Equilibrium Climate Sensitivity (ECS) is on the low end but that the biosphere and human systems are fragile, or one could believe that ECS is on the very high end but that the profit of fossil fuel corporations and distribution of that wealth are an acceptable trade for the effective loss large portions of the developing world’s health and economy on a purely cost-benefit basis. So aside from whether or not one rejects basic physics relating to radiative forcing and planetary energy balance, these labels are irrelevant from a scientific perspective. In terms of causation (or perhaps more appropriately attribution), looking at the global surface temperature response (or the beleaguered lower tropospheric microwave-oxygen-brightness product) and CO2 concentrations alone are going to tell one very little. I would strongly object to this characterization “This graph is often portrayed (to the public) as convincing evidence that CO2 causes global warming.” Plots of the surface temperature record are often portrayed as convincing evidence that the planet is warming. Our understanding of the drivers of climate tell us about causation, and in combination we are confident that warming is occurring and being driven largely by human changes in radiative forcings (principally but not exclusively the combustion of fossil fuels and resulting release of CO2). I have found that people who under the mistaken impression that a plot of surface temperatures is supposed to be evidence of human causation of warming are unaware that there are people who deny that warming ongoing, of the evidence behind the attribution of warming, or both. Without consideration of internal climatic variability (e.g. phasing of Tropical Pacific or North Atlantic variability on high and low frequencies) and non-anthropogenic “external” forcings (such as changes in solar irradiance and volcanic aerosol loading), as well as understanding expected spatio-temporal changes to these through the deep ocean to the upper atmosphere, very little is going to be accomplished in investigating attribution. Alternatively, if this is the start of a comparison of the relative merits of the surface instrumental record vs. the microwave products, I would encourage a deep dive into the methodologies of producing both, as well as their reproducibility, before passing judgment. I have seen a number of politicians and climate skeptics make claims of superiority on behalf of the microwave product that have almost no correspondence to the actual qualities of said product. I am very much looking forward to your future posts. I’m hoping to be ready to put up my subsequent posts in the near future, so I won’t make any long reply to this. But I am puzzled by your objection to my saying that the graph of temperatures since 1880 is often presented to the public as convincing evidence that CO2 causes warming. I see this all the time. For instance, I think there was recently a version of this graph on the White House web site (or some such, I unfortunately didn’t save the URL), albeit with the labels on the two curves accidently reversed. The implication is usually that it’s warming, and there is nothing else that could have caused the warming than CO2. As I note in the post, this is particularly misleading if the 1910-1940 warming is shown, without comment. My initial objection was that surface temperature plots alone were not “often portrayed (to the public) as convincing evidence that CO2 causes global warming” to the best of my knowledge. You’re responding that a plot of temperatures along with CO2 serves as an example. I would suggest that the addition of CO2 to the chart is suggesting a relationship, and that this is not what I originally objected to. Nor do I think that what this other plot is claiming is “there is nothing else that could have caused the warming than CO2”- the figure is from a National Climate Assessment and neither the caption for it nor the surrounding material make this claim based solely on the two increasing at the same time. Indeed attribution is discussed in terms of discriminating between possible natural and anthropogenic drivers. Perhaps this seems nit-picky to you, and if so, I apologize. As someone who tries to reduce misunderstanding about climate change as a side academic interest, I try to make sure all parties agree on their assumptions going into a discussion (at least as much as possible) to preclude avoidable misunderstandings later. Almost if not all materials I have seen targeted at pretty much every age group of the public don’t simply rely on the two variables increasing at the same time to claim causation (the physics are mentioned at varying levels of sophistication), and non-CO2 drivers of temperature change are mentioned as well. Indeed the caption of the second figure you mention makes clear reference to shorter term excursions relating to non-CO2 drivers. This is not to say that you might not be able to find a counter example that does not mention the greenhouse effect or non-CO2 drivers, but I am quite dubious that you will find that surface temperature plots alone are “often portrayed (to the public) as convincing evidence that CO2 causes global warming” if you look around. Again, looking forward to your future posts. I don’t think it is reasonable to expect politicians to spell out the caveats everytime they present a graph in the same way that a scientist would. The IPCC reports make it quite clear that there are natural forcings as well as anthropogenic ones and that these are taken into account in attribution studies. If someone wants to find out the scientific details, then the IPCC reports are freely available and there are many good primers on climate change aimed at the general public. I rather doubt that politicians spell out the caveats when discussing e.g. economics or foreign policy, so I’m not sure why we should expect anything different on climate change (although it would be a good thing IMHO). “Unfortunately, measuring global temperature is not so simple”. None of the surface data sets measure global temperature! They measure global temperature ANOMALY. The surface temperature datasets are based on taking a baseline average for each individual temperature station. Then taking the difference between any individual reading for a station and that stations individual baseline average to produce a temperature anomaly for that station. These temperature anomalies are then averaged, using various area weighting schemes to account for non-equidistant spacing of the measurement stations, to produce regional and global averages of these anomalies. At no time is a global temperature calculated or used. By always using anomalies and averaging them biases in individual readings such as inaccuracies in the individual instruments are cancelled out. This would not be the case if averaging of absolute temperatures were applied. Bear in mind also that it is climate change that is being measured, not weather. So the methods used need to be evaluated based on the degree to which climates across large distances are correlated. Consider the example of the capital of Chile, Santiago. It is close to sea level but the Andes nearby tower over the city. Santiago and those peaks obviously have very different climates, but their climates are correlated; the same weather systems pass over both. Thus any change in their climates will be correlated as well; they experience the same changes in the patterns of weather systems. Thus uncovering the underlying changes in climates is the focus of the design of how these datasets are calculated. If you have not yet done so it would be worth reading Hansen & Lebedeff 1987 which provides the basis for the GISS algorithm. It includes an analysis of these correlation of climates issues. Regarding measuring OHC again anomalies are used, not absolute temperatures, to calculate heat content changes. The thermistors used on the ARGO floats have an accuracy of +/- 0.002 Deg C. And an important factor in this is the question of how much ocean temperatures vary over distances. Basic sampling theory says that sampling interval, whether in the time domain or the spatial domain, needs to be based on the underlying variability of the signal being measured. A rapidly varying signal needs greater sampling density. The oceans do not vary much in temperature over shorter distances so the sampling distances needed to adequately characterise them can be quite large. Yes, I know that GISS data is fundamentally on anomalies, not meaningful absolute temperatures. That’s why I said “These temperatures are expressed as `anomalies’ (in degrees Celsius) with respect to a base period…, since absolute values are meaningless given the arbitrary nature of what GISS is measuring”. For instance, an absolute temperature would be sensitive to how many stations had trees growing near them. For UAH data, although I don’t know the details, I think absolute values ought be meaningful, though they aren’t usually presented. I think, for instance, that one could at least in theory hope to match climate simulation outputs with absolute temperatures derived from satellite data, though I’m not sure whether this is at all realistic at present. I’ve got a little experience with temperature records which may be relevant. I’m mostly interested in communicating and demystifying the science, so a lot of my focus has been on finding the simplest possible methods for calculating temperature records. In the case of the surface temperature data, the simplest methods are indeed very simple. To produce a land surface air temperature record from weather stations takes about 60 lines of code. A simple sea surface temperature record from the most reliable buoy data is about 100 lines of code. Automated homogenization of weather station records can be performed for the densely sampled parts of the network (e.g. the US and Europe) in about 150 lines of code. So these are not complex calculations, and by virtue of simplicity we can comparatively easily analyse for bias and uncertainty. I’d recommend doing the exercise for yourself – it’s a very good way to get a grip on the real uncertainties in the data. And the experience gained from the simple analyses has been enough to lead to a few useful papers. Of course a more complete analysis with uncertainties is more complex, but not excessively so. I’d recommend the Berkeley analysis as methodologically the best, however the Hadley analysis is better from the point of view of quantifying uncertainty. Note, for example, that the RSS data do not produce direct temperature estimates, indeed they need to be calibrated against climate models to account for diurnal temperature variation. As a result, I find it almost impossible to say anything useful about the uncertainties in the satellite data. I have done some analysis of the satellite data against the surface data, which shows for example that the UAH 5.6 data show significant geographical correlation with the surface temperature over land, but not over oceans. The RSS data and UAH 6.0 are sensing higher in the atmosphere and thus show less spatial correlation with the surface air temperatures. However this doesn’t tell us much about bias or uncertainty in the time domain. Estimating either is complicated by the fact that both the climate signal and the internal variability change significantly as you move up through the troposphere, and in particular it is vital to account for the El Nino signal when trying to understand the differences. (In fact the talk is today.) It looks as though RSS are going to produce an ensemble of temperature reconstructions encompassing both uncertainties in the observations and methodological choices in the processing algorithm, similar to what Hadley have done for the surface temperature record. I am hoping that this will provide us, as users of temperature data, with our first opportunity to understand the relative uncertainties in the trends in surface and satellite temperature records. Global temperatures from ice cores can tell us that albedo is the primary modulator of temperature, not CO2. Prof Clive Best has a nice review of the dust-ice-albedo theory on his blogsite. And the bottom line is that ice ages are forced by precessional insolation, but initiated and modulated by dust-ice-albedo. Nice to see such thoughtful comments from a fellow Torontonian. Around 2008, I looked at GISS and inventoried quite a few different GISS versions, including ones back to the 1990s. You’re welcome to it if you’re interested. One of the oddities of GISS at the time (and I don’t know whether they still do it) was a “two legged adjustment”. in which, as I recall, they fitted each station series with two trends and a changepoint, from which they calculated their anomaly. This led to peculiar results, to say the least. It wasn’t clear whether this led to a bias, as opposed to being a completely pointless exercise. I compared it to the meaningless toy in the Peter, Paul and Mary children’s song – it goes zip when it moves, bop when it stops and whirr when it’s standing still. See http://climateaudit.org/2008/06/22/nasa-step-2-another-iteration/. Thanks. I’ve been amazed at the amount of careful, detailed analysis you’ve done on these and other topics. I’ll keep your archive in mind if I need it. Do you know what the copyright status of this data is? Could one just set up a public archive? Or include the data actually used in supplementary information for a paper? As I understand it, as long as the originator of the GISS data was acknowledged, academic use is fair use. I’m sure that you could put it into SI and I would encourage this. If you wanted belt-and-braces, you could ask them for permission. Gavin Schmidt is well aware of the bad publicity that arises out of data refusal and I can’t imagine that he’d object. CO2 has zero effect on temperature. Ice core data clearly shows that temperature change precedes CO2 changes not the reverse as the alarmists claim. The laws of thermodynamics also show zero effect and debunk the AGW hypothesis. in fact there are no papers to date that show that the GHE in fact works. Causation clearly goes both ways: more CO2 leads to warming, and warming leads to more CO2 (released from the ocean). So presenting the ice core data as evidence that CO2 leads to warming without discussing the issue, as is sometimes done, is misleading. But I also don’t think one can untangle the effects in the two directions just by looking at the timing. I think the only viable argument that CO2 has no effect in the end would be that there are strong, negative, non-linear feedbacks that essentially act as a thermostat, keeping temperature within narrow limits. An analogy would be that warm outside temperature has a causal effect on indoor temperature, but nevertheless doesn’t lead to an increase in indoor temperature if the house has a thermostatically-controlled air conditioner. There is a presumption here that temperature data is “random” and accurate. Neither is true. We know about the urban heat phenomenon (where most temperature data is collected from) and the confusing introduction of “homogenised data” and fiddling the dat procedures. We also know about “selective data collection by the meteorology departments globally. No way are the official “data collecting stations” – random. They are deliberately selected or “deleted” to satisfy the authorities. Plenty of work was done by “Watts Up With That.which clearly demonstrate how biased the land data is collected and processed. We should know the differences there are between “global urban temperatures” and global rural temperatures. That might give us a more accurate picture than the methods scientists currently work with. In my view most of the above post and commentary is based on “pseudo information”. Building nonsense onto nonsense. Why is this data continually used as if it is “dinkum”?